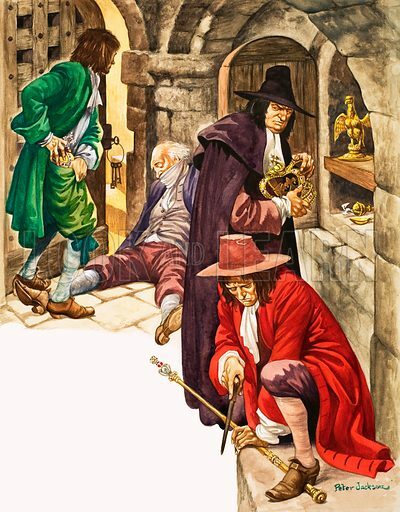 9 May marks the anniversary of a daring raid by Colonel Thomas Blood, who attempted to steal the Crown Jewels from the Tower of London in 1671. Blood, born in County Clare, Ireland, was the son of a blacksmith who fought in England for the Royalist forces of Charles I during the English Civil War. However, he switched sides and became a Roundhead under Oliver Cromwell, for which he was rewarded with land grants and a position as justice of the peace. After the Restoration, he was forced to flee back to Ireland. There, he attempted to kidnap and later to kill the Duke of Ormonde, who was Lord Lieutenant of Ireland. Back in England Blood began planning his audacious crime. He befriended the recently appointed Master of the Jewel House, Talbot Edwards, and convinced him to show the Crown Jewels to some of Blood’s friends. In the Jewel House, Edwards was bound, gagged and hit with a mallet and Blood began stealing the jewels, only to be interrupted by Edwards’s son. Edwards also managed to work loose his gag and raise the alarm. Blood and his fellow crooks fled, but were soon captured. Surprisingly, he was pardoned by the king for reasons that remain unknown. Many more pictures relating to crimes throughout the ages can be found at the Look and Learn picture library.